Alkene epoxidation is an exciting reaction in which a double bond reacts with a peroxy acid to form an epoxide. This is considered a syn addition since the oxygen is bound to 2 carbon atoms. Most organic chemistry students are not required to know the mechanism for epoxidation, however I find that knowing the mechanism will help you understand the product for this reaction. 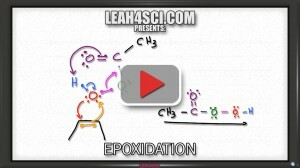 The video below starts with a peroxy acid introduction including mCPBA and peroxyacetic acid. This is followed by a shortcut to quickly find the products, and finally the concerted cyclic mechanism to form the epoxide and carboxylic acid. Which december for ozonolysis ? Is there any video for mechanism of onozonlysis reaction (both oxidation and reduction)?